Set back seat posts (along with curved seat tubes) are one thing that translates well from grass polo. But an all black brakeless fixed gear with gold hubs... meh. 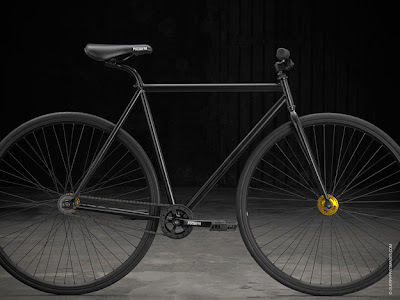 I love polo bikes, i love 48 spoke wheels, and i love short stems, but i'm just not into this bike for some reason. While I do like that EXIF writeup though, i think this bike may be a bit too European for my tastes-- give me a Joust any day. are these 700 wheels? they seem to dominate the frame, which makes it seem a little unwieldy on the court. interesting tho. btw zach what explains slung back seat posts? i imagine one would want to be forward as possible in polo. i have a problem with the frame, its unreinforced 1020 steel. which is pretty soft, and its a bmx company, you'd think that they would at least spring for 4130 with gussets reinforcing the headtube. i'm with you, i don't like it.